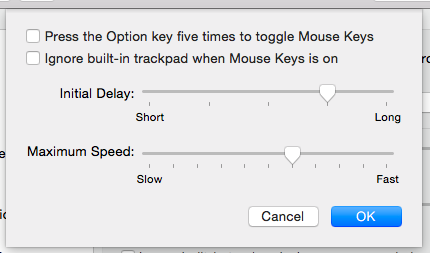 Apple lets users who occasionally want the use of Mouse Keys to enable/disable it by pressing Option (⌥) five times. I use Maya, so I'm constantly using the Option key to manipulate the camera, and this usage often triggers Mouse Keys. Unfortunately, this disables the rest of my keyboard (see this Apple KB page) and I can't use other helpful shortcuts. I can of course disable it again, but it's annoying when I have to do it again and again. I went to the appropriate place in System Preferences to disable this (Universal Access > Mouse & Trackpad), but it's greyed out. I've done extensive searching and haven't found anyone with a similar problem. Why is this happening, and how can I stop it? To avoid editing plist or avoid command line, you can still do it in the prefs menu. 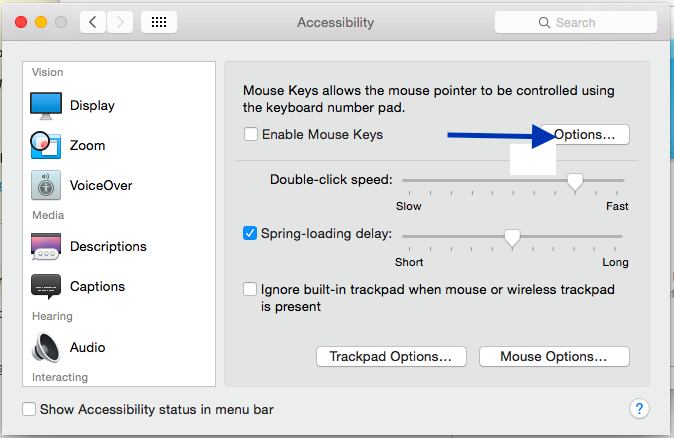 Go to System Preferences > Accessibility Preferences > Mouse and Trackpad > Options > Press Option Key five times to toggle Mouse Keys" (1st option). You have to uncheck "Ignore built-in trackpad when Mouse Keys is on", first. Also, you can do this via Terminal by typing defaults write com.apple.universalaccess useMouseKeysShortcutKeys NO and pressing enter. You may need admin rights to do this. Not the answer you're looking for? Browse other questions tagged keyboard system-prefs mouse-keys . How do you change the keys inserted while holding the Option key?